The 68-series is plug and play out-of-the-box and comes with multiple inputs, speakers and VESA mounting pattern allowing them to be easily installed and used in almost any situation or environment. The infrared touch technology, with up to 20 touch points and fast response guarantees an accurate, seamless and fluid interactive experience. 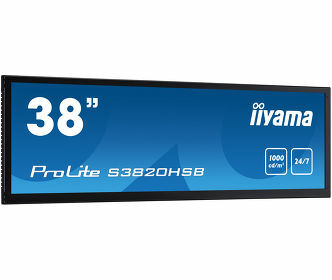 The displays feature an IPS panel for exceptional colors, high brightness and maximum viewing angles from anywhere in the room. The 4K resolution offers amazingly detailed visuals with a viewable area that has 4 times more information and workspace than a Full HD screen. 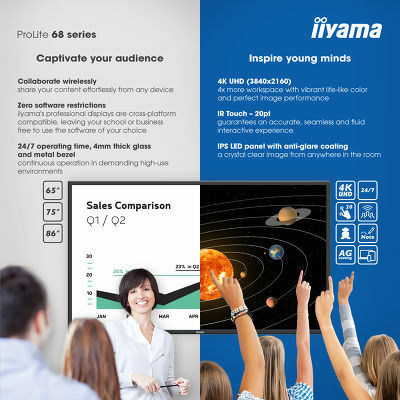 The 68-series comes with iiyama’s Android-based collaboration software containing Note, a whiteboard annotation application, a web browser, file manager and the option to use iiyama’s Wi-Fi module for wireless cross-platform sharing of information. 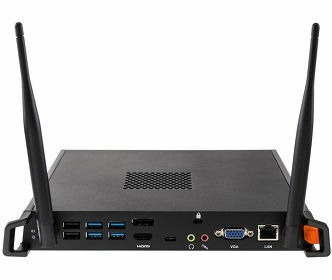 Note allows the display to be used as a digital whiteboard; capable of saving and sharing the content via the Cloud, making annotations on presentations, documents or images or play rich-media content effortlessly from USB flash drives or internal memory. The displays are compatible with Microsoft Ink Tools.